Head of Banking Operations job is offered in Sindh Bank Limited, which belongs to Bank. The Working hours for Head of Banking Operations job in Sindh Bank Limited is 8 hours a day and 40 hours a week. So, Head of Banking Operations job is a fulltime job and it is located in SINDH Karachi. The required qualification for Head of Banking Operations job is mentioned in the advertisement. 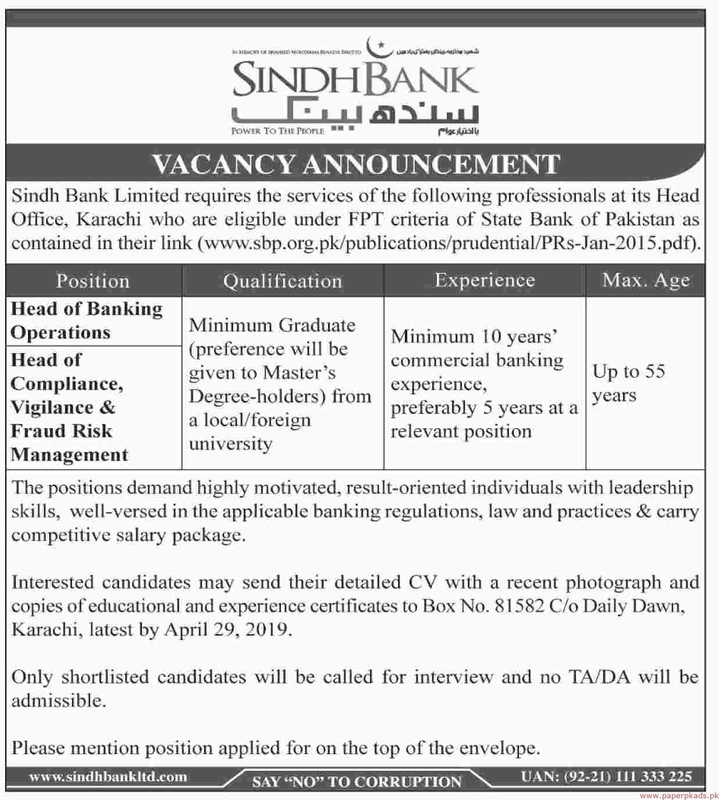 The advertisement for the Head of Banking Operations job is published in Dawn Newspaper on April 15th, 2019, Monday. The salary package for the Head of Banking Operations job is also written in the advertisement. Last date to apply for Head of Banking Operations is April 29, 2019. The complete method to apply for the job along with complete description is mentioned in this advertisement.